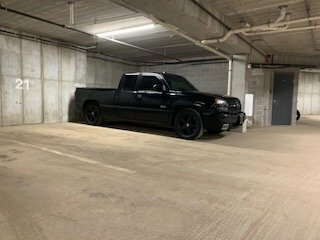 I have always liked these trucks and after buying a house last year and a wedding coming up I decided to I sell my 2014 Silverado and get a cheaper truck I like more to save a few bucks. Over the weekend I picked up a clean black 03 SS. I bought it from the third owner who did not do all the bolt ons so I don’t know everything that has been done yet. I will get some pics up shortly for everyone! The only things I’m not happy with are that the truck came with a fiberglass tonneau cover and a roll pan. Does anyone know a good source to find an OEM rear bumper? I ride dirt bikes so I can’t have the hard cover. I will have a roll pan and fiberglass cover for sale if anyone wants first dibs!